Prime Minister Nguyen Xuan Phuc has delivered Vietnam’s strong message, aspiration, and determination to become a “country of renovation and creativity” and an economy with globally extensive connectivity when engaging in every activity of the World Economic Forum (WEF) 2019 in Davos, Switzerland. He participated in 37 activities where he and heads of State and Government leaders of 50 countries and executives from leading groups around the globe discussed and dialogued matters relating to the forum’s theme “Globalization 4.0: Shaping a Global Architecture in the Age of the Fourth Industrial Revolution”. PM Phuc said the Fourth Industrial Revolution is “knocking” on every enterprise and bringing profound changes that no country can be an outsider, and delivered Vietnam’s wish to become one of the passengers at the forefront of the Industry 4.0 train, and enthusiastically work with other countries to build a wealthy world. He presented two initiatives with the one on establishing an open public-private partnership forum on climate change response and marine ecological environment protection and the other on WEF’s coordination with partners to study and push for the establishment of a global network to share sea and ocean data. In Davos, PM Phuc and WEF President Borge Brende had a dialogue themed “Vietnam and the World”, which is the first-ever event on Vietnam held the WEF. Through the dialogue, PM Phuc conveyed strong messages about Vietnam’s development and international integration, asserting that in the current circumstance, Vietnam has maintained an economic growth and socio-political stability that demonstrates itself a reliable destination for foreign investors coming to do business. He asserted the Vietnamese Government supports breakthrough business ideas and models, in particular creative and renovation values, startup spirit, and progressive trends that bring in benefits and conveniences for people at his meetings and dialogues with executives of multinational groups and leading businesses, such as GE, Total, Siemens, Pepsico, Sumitomo, Procter & Gamble, Nokia, and more. He called on international businesses to come to Vietnam and produce 4.0 products in the country. The executives of leading groups said they acknowledged the Vietnamese Government’s efforts in improving the business environment and showed their support for the European Union-Vietnam Free Trade Agreement (EVFTA). During the trip, Vietnam and the WEF signed three cooperation agreements, with the one on building a 4.0 Centre in Vietnam, which will be connected with other WEF’s 4.0 Centres around the world. 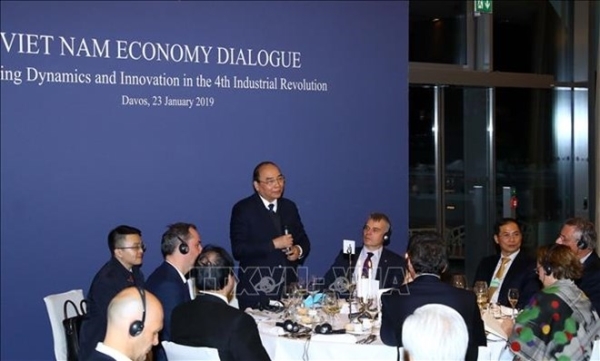 As the first multilateral diplomatic event of Party and State leaders in 2019, PM Phuc’s WEF Davos 2019 trip from January 22-25 was a success in the spheres of politics, external relations and economics. The trip reflected Vietnam’s vision and determination in renovation and integration, raising her role and position while garnering interests from the international business community in expanding cooperation and investment with Vietnam, and kick-starting a year of pro-active, creative and efficient diplomatic events in service of the national development. The WEF was established in 1971 as a not-for-profit foundation and is headquartered in Geneva, Switzerland. It now engages the foremost political, business and other leaders of society to shape global, regional and industry agendas. Vietnam joined the forum in 1989.